The improvisational music of Miles Davis reverberates off the walls in the college dorm room of Vince Tampio and Mike Kadnar. These two SUNY New Paltz music students make up half of the jazz band Quatrane. Jazz flows emotionally through the instruments of these musicians and transforms into notes for their listeners to experience. The quartet fell in love with the expressive power of jazz music and they all incorporate those sentiments into different aspects of their lives. Kadnar takes three days out of his hectic week as a college student to drive to Orange County and immerse his 15 music students, ranging from the ages of 5 to 15, in one-on-one drumming lessons. All of the members of Quatrane are music majors at SUNY New Paltz with a concentration in jazz studies. They have built their college careers around the disciplined yet improvisational style of jazz music. These college students were all introduced to jazz at different stages of their lives. Jazz is changing more and more as times goes on. As the original generations of jazz listeners begin to diminish, many lovers of this genre are fearing for its future. Quatrane is already well on their way to playing the type of jazz music they expect to see in the future. 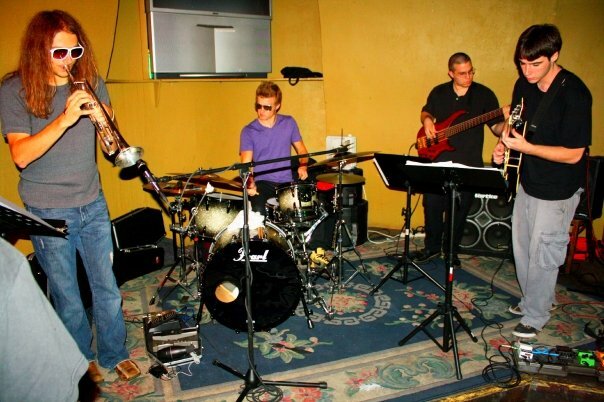 With eclectic musical tastes that range from classic rock and blues to death metal, this group, which defines their music as “rock jazz fusion” is already fusing the style of classical jazz with a hip modern twist. Jazz music evokes an impromptu style in all who play it. This mentality is evident in all of Quatrane’s music. Read more about Quatrane’s Debut here.